You are here: Home / Officer Safety / Officer Safety Video: Ohio Frisk Turns Deadly! EDITOR’S NOTE: Periodically BlueSheepDog posts officer safety training articles. Many of these are based upon police videos. The intent of these posts is to discuss the encounter and tactics used with our readers. Our hope is to educate officers on the dangers they may face at any time, and to learn the good and not so good from the encounters other officers have faced. These posts are not intended to disparage the involved officer or their department in any way, but are solely intended to be used as a “lessons learned” method of education. In this incident, Officer Hilling performed very well, and was able to counter the deadly assault eventually allowing the suspect to be taken into custody. 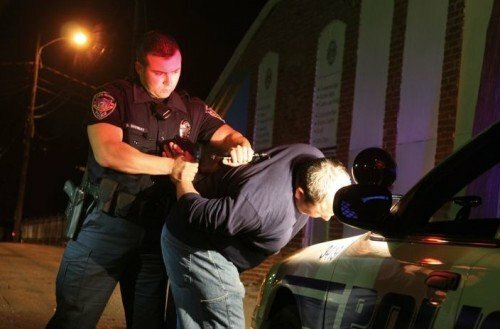 There has been a lot of negative press on the concept of “stop and frisk” lately, especially in the context of how the New York City Police Department was using the technique in their crime fighting efforts. The basis of this type of contact was etched into the police lexicon with the famous U.S. Supreme Court case of Terry V. Ohio (1966). In Terry v. Ohio the Supreme Court ruled that police officers may stop and detain citizens if they have reasonable suspicion to believe the person has been, is, or is about to be involved in criminal activity. Reasonable suspicion goes much further than the subjective hunches of a police officer, and requires articulable facts and circumstances when combined together would lead a reasonable and cautious police officer in the same situation to believe criminal activity is afoot. The Supreme Court did not stipulate how many factors must be present before reasonable suspicion is satisfied, instead relying on a prevalent theme of the Court in evaluating reasonableness – the totality of circumstances doctrine. Sometimes reasonable suspicion can be established with just a few observations, while other times the officer must document a lengthy series of observations and knowledge to justify the stop. In addition, during a lawful reasonable suspicion stop, if the officer can articulate why they believe the suspect may be armed the Supreme Court allows a “frisk” of the outer clothing to ensure a weapon is not present. A “frisk” differs from a search, in that the officer is only allowed to “pat” the clothing with an open hand. Any grabbing, or manipulating of the clothing (without reason) is considered a search and must then be supported by probable cause or consent. Some of the complaints in New York City, Chicago and Philadelphia have centered around whether the stops of pedestrians have had legitimate reasonable suspicion, or whether they were pre-textual in nature. For instance, African-Americans were stopped and frisked nearly three times as often as all other races combined. In addition, these stops only resulted in arrests 6% of the time, or a summons 6% of the time. With nearly 90% of the stops having no action, there is fuel for debate. However, since the NYPD has drastically reduced this practice, violent crime has risen double-digit percentages. When Officer Hilling confronted Pablo Javier Aleman on the side of I-75 in Hamilton County, Ohio he had no idea that he was face to face with a murderer. The older male had all the appearances of a drifter, and initially seemed very cooperative with the officers instructions and questions. The contact was made in broad daylight with many witness motorists nearby. However, in a split second went from compliant to confrontational. Many deadly force encounters unfold just as quickly, and the use of a body camera in this incident allows us incredible insight into how this event played out. Aleman had already committed a murder in another State, and his actions may have been under the belief that Officer Hilling would discover his crime. Indeed, it is believed the same long knife Pablo produced to attack Officer Hilling is the same knife he used to kill in the other State. Appears to have trouble spelling his last name. Any one of those observations alone may mean nothing, but my experience tells me more than two is not only suspicious but indicative of lying. Lying alone is not criminal, but discovering lies can absolutely rise to the level of reasonable suspicion. Especially when the questions were not about criminal activity, but just simple questions about who you are, where you were coming from, or where you are going. Remember, reasonable suspicion is more than a hunch, but less than probable cause. Recognizing the subtle clues of deception, the hesitation to answer simple questions, fidgeting, and fleeting looks around are all indicators that the subject has something to hide. Taking appropriate counter measures are appropriate and clearly articulable. It appears Officer Hilling recognizes these very signs of deception. He requests Pablo to walk to his patrol car, where he states he intends to “pat you down for officer safety”. This instruction and explanation was clearly spoken, in a tone louder than normal conversation. Again, Pablo asks “huh”, and Officer Hilling repeats his statement. 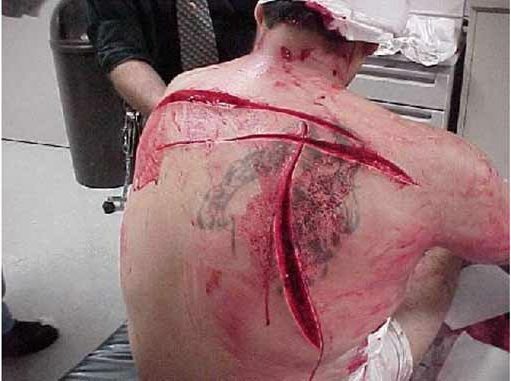 Knife attacks are extremely dangerous. Some believe more dangerous than firearms. As soon as Officer Hilling grabs hold of Pablo to start the frisk, this contact went from cooperative to deadly. 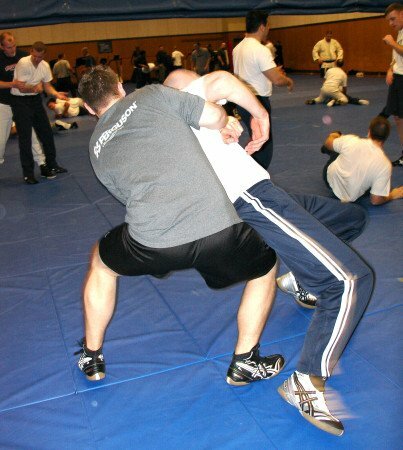 Just like your defensive tactics instructors taught about the moment the handcuff touches the suspect, the same applies to going hands on for a frisk. Officer Hilling responds admirably, disengaging with Pablo and creating distance. When Pablo turns and produces a large fixed blade knife, he begins screaming “kill me, kill me now”, while charging the officer. Officer Hilling retreats while drawing his sidearm. As Pablo closes in Officer Hilling fires two shots, one of which strikes Pablo in the stomach. Though Pablo drops at first, he is able to stand back up, and continue to move towards Officer Hilling while holding the large knife. This officer had martial arts training, but mistakingly took on a knife wielding assailant. Most States provide laws allowing police officers the legal authority to not retreat. This is for obvious reasons. The police are hired to serve the community by protecting innocent civilians and maintaining order. If the police were obligated to retreat first, it would provide opportunities for victimization and chaos and the escape of those responsible. Officer Hilling could have stood his ground, and when Pablo continued his attack he would have been well within his legal authority to continue using deadly force to stop the threat. However, Officer Hilling calls for back-up and begins the arduous task of tactically retreating. In my opinion this was a great decision, despite being legally allowed to shoot Pablo again. Knowing Pablo was struck by at least one bullet, and realizing he could continue to create distance, Officer Hilling decided to give clear commands while keeping that distance. In an extraordinary display of the sanctity of life, Officer Hilling is able to keep his distance until backing officers arrive and Pablo can be incapacitated and taken into custody. During the entire event, Officer Hilling keeps his sidearm ready and pointed at Pablo in the event Pablo makes a charge. Thankfully that did not occur, and now a murderer can face justice. Officer Hilling did an amazing job of countering a deadly assault. What appeared to be something as simple as a drifter walking down the highway, turned into a moment of life or death. In just six seconds Pablo pulled away from Officer Hilling, produced a large knife, charged the officer, and was shot in the stomach. This required a very fast reaction, identification of the threat, and decision to shoot. There are a few points that all officers can take away from this incident. These points have the benefit of 20/20 hindsight, and I only bring these up that officers faced with a similar situation may avoid potential pitfalls. At 1:17 in the video Officer Hilling appears to be just calling in the contact. I base this on the fact Officer Hilling is providing dispatch his location, and activity. It is possible a previous radio call was made, but it seems odd that this information would be repeated. Obviously, providing dispatch your location and activity prior to making contact would be a best practice. At 1:42 in the video Officer Hilling is escorting Pablo to his patrol cruiser. However, in the process Officer Hilling telegraphs his intentions by telling Pablo he wants him to place his hands on the trunk so he can check him for weapons. Hilling explains that he is doing this for “officer safety”. This innocuous statement appears to be an effort to be forthcoming, polite, and professional. The intentions all seem to be good. Yet this statement starts the chain of events that would lead to the attack and deadly force engagement. Pablo picks up on the change, and is beginning to formulate his plans. To delay Officer Hilling, Pablo pretends like he didn’t hear what Officer Hilling said, a classic delay technique of those planning to fight or flight. At 1:48 Officer Hilling is just starting to restate his intention to frisk Pablo, when Pablo pulls his right arm away and spins away. Officer Hilling makes one attempt to grab Pablo back, before stepping back and preparing for the fight. At 1:52 the video shows Pablo has retrieved the large knife from an inside pocket of his coat. He has raised it in a threatening manner, and is beginning to advance towards Officer Hilling. This is the moment of truth. Almost immediately, Pablo begins screaming, “kill me, kill me now”. The mindset of Pablo may never be known. Was he truly attempting suicide by cop, or was it just another distractionary technique to throw Officer Hilling off. Remember, Hilling is behind in the OODA Loop, but doing very well at catching up. At 1:55 Officer Hilling has retreated to the front of his patrol cruiser and fires his first shot at Pablo from only about 5 feet away. It may have been only one shot, but it sounds like a possibly second shot is made a second later. Regardless, a shot strikes home and Pablo crumples to the ground. Unfortunately, this is not the end of the engagement and Pablo is back up after a few seconds. Pablo falls several times, but each time regains his feet still holding the knife. At 3:00 Pablo is still capable of doffing his coat and hat, and continuing his slow walk towards the officers. Officer Hilling has provided multiple commands to “get down” and “stay down”, as well as “drop the knife”. None of the commands have been heeded by Pablo who is still presenting a deadly threat. Pablo is still begging to be killed. Officer Hilling is obviously amped up, but thankfully back-up is not far away and the first officer will be on scene in just a few seconds. By 3:43 multiple additional officers have arrived on scene. The multi-lanes of I-75 have been shut down, but as Pablo continues to advance back the way they came he is starting to approach innocent motorists. This will present additional problems and decision-making for the officers. At 4:10 Pablo has reached one of the secondary backing officers’ patrol cruiser. Unfortunately, the driver’s door was left open. It is not clear if the keys were left in the ignition and the engine was running, but obviously that could have been a really bad situation if Pablo attempted to steal a police cruiser. At 4:36 the officers and Pablo have backed up to the first innocent civilian’s vehicle. Obviously Pablo is armed with a knife, and not a firearm. The threat potential is more limited, but contingency planning has to kick it into high gear before Pablo has even the chance to try to jump into an innocent person’s vehicle. Remember the Priority of Life scale. Though we want to take Pablo into custody alive, the Priority of Life scale dictates that we must protect victims and innocent bystanders above the suspect. By 4:45 the adrenaline is wearing off and Pablo bends over obviously feeling the effects of the bullet wound. Pablo begins looking to the heavens, holding the knife up, and continuing his plea to be killed. At 5:20 loss of blood catches up to Pablo and he collapses on the shoulder of the highway. Multiple officers then approach Pablo, remove the knife and place Pablo into handcuffs finally bringing this horrible incident into control. It is not until 7:10 that a backing officer removes Officer Hilling to the other side of the highway. Controlling suspects is critical to officer survival (photo from Pintrest). STAY ALERT – Officers must constantly remain alert during contacts with the public. Even mundane actions like a motorist assist, or directing traffic requires the officer to remain aware of their surroundings and have contingency plans prepared in the event of the unexpected. In roll call discussions I have laid out scenarios (some made-up, some from real events) that officers could encounter and we discuss actions and counter-actions that could be taken to survive the event. This involves everything from winning a deadly force encounter to surviving a reckless motorist that drives into your crash scene. 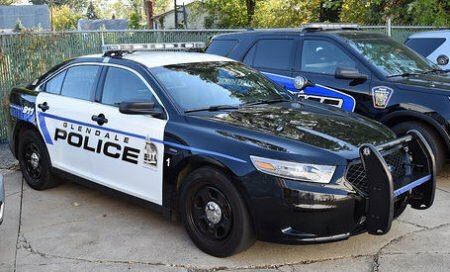 BE PHYSICALLY FIT – According to the Glendale, OH Police website Officer Hilling likes to run marathons in his spare time. Personally, I think that is nuts but being in very good physical condition is a must for this job. One of the best SWAT mottos I’ve ever heard, and try to live by every day, says, “Your worst must be better than their best!” I’m confident that Officer Hilling’s physical conditioning helped him process the threat, react, and remain engaged throughout. The physicality required for officers to survive on the streets. (photo by leelofland.com). DON’T TELEGRAPH YOUR INTENTIONS – When going to frisk someone it is not a good idea to alert them too soon before the event. Any time officers are going to touch someone it is best to tell them what is coming and why. However, that can take place when the person is already in a position the officer controls. Telling the person too soon allows the violent person time to plan an attack or escape. HAVE PREPARED CONTINGENCY PLANS – When the fight or flight comes, officers need to have already gone through their mind how they are going to respond. Officer Hilling attempted to grab Pablo once, but quickly disengaged and brought his pistol to bear. This was a very good tactical decision, because continuing to try to physically control Pablo would have placed both of them dangerously near the lanes of a busy Interstate highway. The decision also allowed Officer Hilling to clearly see Pablo’s actions, and properly prepare for the deadly encounter. CONSIDER TACTICAL RETREATING – Tactical retreating should never be considered cowardice. In fact, it should be taught to all officers as a means to gain a tactical advantage when a suspect has made a move that temporarily gives them control. Here, Officer Hilling’s retreat allowed him to obtain a solid grip and shooting position, clearly observe Pablo and the deadly weapon, time to give several orders, and then the opportunity to fire an accurate shot into his adversary. RECOGNIZE ALTERNATIVE RESPONSES – As mentioned before Officer Hilling would have been completely justified if he had shot Pablo again when Pablo stood back up and continued to aggress him. However, Officer Hilling recognized that Pablo was injured, and cautiously maintained an adequate distance with his firearm squarely aimed at Pablo. This provided Officer Hilling the opportunity for alternative responses. Here, tactical retreating until Pablo collapsed. However, as backing officers arrived the use of a Less Lethal Shotgun, Taser, or O.C. spray could all have been viable options to stop Pablo. PREPARE FOR THE ADRENALINE DUMP – Deadly force encounters are extremely stressful situations. It is natural for all of us to get amped up. The adrenaline dump can be overwhelming if we are not in top physical shape. However, when we have the opportunity to disengage our suspect an officer should reflect on their performance, their words, and their tactics to determine what is working and what is not. In the first few minutes after the attack Officer Hilling is yelling at the top of his voice, but to no avail. CONTROL BREATHING AND VERBAL COMMANDS – Officers should recognize the suspect is not responding and try a different approach, like lowering your voice and trying a calm appeal. I know this sounds crazy (appealing to a lunatic murderer), but in some cases it has been enough to penetrate the offender’s adrenaline dump and allow them to realize only worse things can happen by continued resistance. When I was in the Police Academy my instructors taught us to yell at suspects so “everyone will hear you”. The thought was witnesses would be able to confirm your lawful orders in the event serious force had to be used. While that is a valid point and technique, it is extremely hard to tame the animal once it is out of the cage. I believe yelling the first few commands in a situation like this are not only appropriate, but simply a natural response. Continued evaluation will hopefully allow the officer to realize yelling only strains their own breathing and keeps them at an intense level that can only be maintained for short durations. Trying to keep that level up will only result in fatigue and exhaustion. COORDINATE WITH BACK-UP FOR A QUICK RESOLUTION – Once back-up arrives a real plan of apprehension must be quickly devised. Are their less lethal options available? That is the reason we did not continue to shoot right? We want to arrest this guy and have him face trial. I get the desire to send this murderer to a final judgment, but that has a much stronger impact on the officer and is another topic of discussion. So if we’re at the point of tactically retreating and collectively giving orders, how far does it go. We should recognize when we are getting close to innocents and make our move to end this. CALL FOR PARAMEDICS SOONER THAN LATER – Officer Hilling advised Dispatch he had shot Pablo, and he was the only person wounded. There was not a direct call for paramedics by the officer, but hopefully Dispatch had that started as a standard procedure. Waiting too long after Pablo is in custody could create liability – we have a duty to provide aid. This is another great reason to have Trauma Kits in patrol cars. SEPARATE INVOLVED OFFICERS QUICKLY, RENDER AID – Once Pablo is in handcuffs backing officers should have removed Officer Hilling as quickly as possible. This is an extremely traumatic event, and the sooner he can begin to unwind the better. In addition, backing officers should NOT take the involved officer’s statement of no injury as fact. A thorough pat down by a backing officer should be conducted quickly to ensure stress and adrenaline aren’t hiding a serious injury. Be ready to provide emergency trauma care just in case. PROVIDE ASSURANCE TO THE OFFICER – Finally, provide immediate and frequent assurance to the officer. The officer involved is on an emotional roller coaster. They’ll want to talk and explain the justifications for what they did. Slowly but surely the doubts and fears of what comes next will creep in. Frequent assurance is the best way to stave off the emotional collapse. Even if the shooting or use of force appears questionable, at the scene the immediate support by fellow officers is critical. A detailed investigation can be done later, but at that moment our brother or sister needs support.